If you are looking to get away from your everyday city life to spend some unforgettable days amid unspoilt virgin mountain nature and want to enjoy characteristic local products, the Kelmend region in northernmost Albania bordering Montenegro is the perfect place where you’ll witness the centuries-long dialogue between human kind and the nature. The newly reconstructed road to Tamara has made these once unreachable wonders, accessible again. The ancient mountain paths have been equipped with tourist signs while local tour guides help tourists explore breathtaking caves, canyons, waterfalls, river streams, springs and plateaus, says the National Tourism Agency. British writer and traveler Edith Durham was also fascinated by Kelmend and the Malesia e Madhe region which literally translates as the Great Highlands. “The unspoilt villages have many treasures to explore and a culture to inspire and move. Peace and tranquility will be the outcome of exposure to family life. Family-run traditional guesthouses provide a warm welcome for guests with authentic cuisine for gourmets, uncontaminated nature for the naturalist and mountains for the adventurous lovers of arduous climbing. Proficient and capable guides will lead you through awe-inspiring terrain,” says a Kelmend-Shkrel promotional portal. “All the above is embellished by the wit and hilarity of inhabitants making hospitality a sacred law, unchanged over the years and centuries which in the early 1900s led young lady Edith Durham to fall in love with Northern Albania,” it adds. One of the largest settlements of Malesi e Madhe, Kelmend is home to some 6,000 residents stretched in an area of 353 km and boasts some of the most impressive landscapes in the Albanian Alps, says a newly launched Kelmend Guide, a publication of the German Agency for International Cooperation, or GIZ and Italy’s VIS – International Volunteer Service. There are eight villages in the region: Tamarë, the administrative centre of the Kelmend region, at 280 meters above sea level (m.a.s.l. ); Broja, which resembles a fortress due to the rugged mountains and rocks surrounding it, lies 12km south of Tamarë at 200-850 m.a.s.l. ; Nikç, 15 km east of Tamarë, which is rich in caves, springs, waterfalls and beautiful scenery; Selcë at the altitude of 353- 1,100 m.a.s.l. is home to the largest canyon in Kelmend, a waterfall and interesting mountain trails with many caves to be explored; Lepushë, at 1,200 m.a.s.l. lies in a beautiful valley and has many stories to tell; Vermosh, one of the remotest villages at 1000 m.a.s.l. invites hikers to explore the surrounding mountains; and Kozhnja, Vukël, which have not been developed touristically yet. 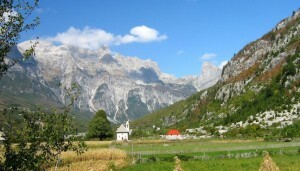 Kelmend is close to the regional natural park of Shkrel and Kastrat as well as Theth and Valbona, two other popular mountain tourism destinations. Archeologists have found Illyrian coins in Selcë and ceramic fragments, copper and iron tools, animal fossils and charcoal drawings from the Bronze Age, indicating early settlements in this area. Procopius of Caesarea (6th century A.D.) mentioned a Byzantine castle called Clementine in his writings to be found in what today is the region of Kelmend. 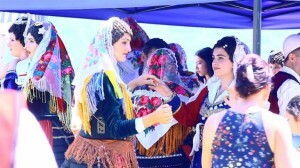 Today visitors can find good, basic accommodation if they want to staying longer in Kelmend to carry out different outdoor activities or take part in cultural festivities in Tamarë, Nikç, Predeleci Pass, Lepushë and Vermosh. The beautiful nature, the hospitality of the people and the delicious local food will make a visit to this region an unforgettable experience. There are several karstic caves in Tamarë which can be explored by tourists, however for safety reasons it is recommended to always visit caves accompanied by local guides. In the caves Nënfateshe, Bunëve të Macurkut, Bunëve të Lucajve, Lugjeve të Bardhit, and Vizit remnants of previous human dwellings have been found. It is located at an elevation of 1165 m.a.s.l., at the bottom of the rock of Malqe Gruda, about 2 km away from Tamarë’s neighbourhood Pojatë e Sipërme. In front of the cave tourists can have a great view of Tamarë and its surroundings. There are two entrances close to each other connected through a 310 m long tunnel. Inside the cave are calcareous tufas, a small lake, stalactites and stalagmites. Along the way there are extensions up to 25 m wide and then at a depth of 95 m a narrowing of the cave is encountered. At the end the cave is separated into four directions forming narrow corridors. The cave of Gjaçka, in the vicinity of Nikç, can be found at around 200 m of its center. The dark entrance is about 20 m high and leads towards a cave with several recesses formed by water that has been passing through the cave many years ago. The Cemi River originates in the so-called “Accursed Mountains” (Bjeshkët e Namuna) at 1650 m.a.s.l. and represents an interesting habitat, abundant in brown, marble and rainbow trout. To enthusiasts, the river basin offers a great opportunity for bird watching, whilst others can simply enjoy the sandy riverbanks and pools which have been formed. Numerous canyons can be visited along the river, such as the canyon of Drenovë (1.4 km long and 100 metres deep), the canyon of Gërrle (900 m long and 25 m deep), or the waterfall of Sllapi, which is about 30m high. Historians have found written records of a long, narrow bridge which has been built in the area to allow merchants to travel from Gusinje and Plav towards Peja, Prizreni and Shkup. It is said that in the 18th century the Pasha of Shkodra, Kara Mahmud Pasha, was convinced by his wife Tamara to build a new bridge after the old was flooded. As a result, she got stuck in the present day Gusinje and Plav, where she had been visiting her family. Being greatly impressed by the region and the people, she told the Pasha to erect a new bridge. The inhabitants rewarded Tamarë by giving the bridge and the village her name. In the centre of Selcë village, the water of the Cem River has created the Canyon of Gerrlë, which has a length of 900 m and a depth of about 25 m. At parts, the canyon gets so narrow that the crowns of the threes which grow on both sides of the canyon touch each other. These peaks are famous for the large number of springs which can be found: exactly 365 of them, just like the number of days in a year. Hiking in these mountains, tourists can be welcomed into shepherds’ huts where they can try roasted meat and dairy products. Selcë village is home to the 30 m high waterfall of Sllap. Beautiful rainbows are created on sunny days when the sun light is reflected by the water drops. Local guides can show visitors the way to the waterfall along an easy trail. People of the Alps are known in Albania for their hospitality and eagerness to help their guests in every way possible, their humor and their talent for telling stories about the past and local traditions. It is not unusual for the hosts of a guesthouse or a restaurant to sing to the sound of a lahuta (a one-string traditional instrument) or a çifteli (a two-string instrument). The appreciation for guests can also be found in the food with a large variety of local products and dishes. Tourists can try different ways of preparing meat and fish; maize and potato porridge (kaçimak), sour cream (maza), boiled cheese and Mishavinë cheese. In the gardens around the houses, the families produce different vegetables, as well as the potato of Vermosh, and different kinds of fruit like plums, grapes, cornel cherry, Gentian, blueberries and pears. All produce is grown organically in the area, making a trip to Kelmend also a culinary experience. Hiking: Several trails exist in Kelmend allowing tourists to discover the various valleys, canyons, springs, the rich flora and fauna, but also to learn about the history of the region and the local culture. Guides trained to meet tourists’ expectations can accompany tourists to point out cultural monuments and natural highlights along the way. Different nature, culture and history- themed tours can be organized based on hikers’ experience and conditions. Summer and spring are recommended for hiking, as during winter the trails might be blocked due to heavy snow. Kayaking: From October to November and from March to April Cemi river reaches the appropriate levels so that experienced kayakers can practice this sport. It is not recommended to tourists who have no experience with this kind of sport. Interested tourists should contact the Tourist Information Office beforehand for further information or arrange with tour operators in Tirana. Mountain Biking: Cycling enthusiasts can find numerous unpaved roads in Kelmend allowing them to breathe clean air and enjoy a variety of wonderful alpine landscapes and river valleys of “Malësia e Madhe”. Caves: Kelmend’s different rock formations, caves, natural crevices, glaciers, etc. are very attractive for those wishing to discover the Albanian Alps underground. For safety reasons, these places always have to be visited accompanied by local guides with vast experience. Horseback riding: This comfortable way of exploring nature has become a popular activity offered to tourists. Numerous guesthouses and families are engaged in horse breeding and organize different trips with horses in the area. Due to the relative remoteness of the area, a large variety of genes, species, ecosystems and landscapes – involving biodiversity – can be found in the Northern Alps of Albania. People living there have preserved traditional farming practices over centuries, thereby protecting local native plants and breeds which provide for their livelihoods. Hikers may get a taste of this exciting and colorful agricultural biodiversity, be it different varieties of grapes, cherries, maize, tomatoes, chestnut, sage or lavender or agricultural produce such as wines, salads, jams and teas or cheese and other dairy products from local breeds of goats and cattle. Growing native species and looking after animals unique to this region helps to mitigate negative impacts of agriculture on biodiversity and to restore and preserve local ecosystems. This is important in order to preserve the quality of soil, air and water which in turn allows rare species of wild plants and animals to survive and flourish in the protected areas of the Albanian Alps. “Conserving agro biodiversity in the Northern Alps goes along with sustainable economic and social development: farmers can compete on the market offering a larger variety to their customers. They can sell their mountain products to different guesthouses and shops in the region. This in turn attracts tourists who want to learn more about the origin of certain products and the way they are processed,” says the German-Italian Kelmend guide. Typical products and herbs include the Balkan brook trout, the wild pomegranate, Gentian (Gentiana Lutea) and the pig of Kelmend. Kelmend is known in Albania and abroad amongst cheese lovers for its “Mishavinë”. This is a particular cheese using sheep and cow milk, produced mainly in Lepushë and Vermosh. Using a recipe which is over one hundred years old, Mishavinë is only produced during few months every year. People of the area are proud to have maintained the old way of producing it. Mishavinë is sold during fairs and in the most popular traditional restaurants of Albania and abroad. Blueberries are found in the mountain pastures of Kelmend and collected in late August/September. The fruits are used as a traditional medicine due to their properties (i.e. they are rich in vitamin C). Blueberries are said to improve the sight, clear arteries, strengthen blood vessels, and improve intellectual capacities. Locals cook jams out of the fruits which can be tried by the tourists when visiting Kelmend. Wild sage, or medër in Albanian can be found mainly in the villages of Tamarë, Grabom and Selcë. It blooms at the end of May and with the beginning of July it is possible to start harvesting as the flowers have fallen down, involving the entire family. To collect wild sage a small sickle is used in order not to cut the roots which stay in the soil. The plants grow 10-20 cm, according to the quantity of sun they receive, and the bushes usually consist of at least 10 stems. The elliptically shaped leaves are grey-green and rugose on the surface, while flowers are very small and violet. In Kelmend, the wild sage is used to flavor raki, the local traditional alcoholic drink, or for tea. It is said to cure diarrhea, dizziness, nerve and liver disorders, and to help breastfeeding women. To discover the breathtaking views and the different natural and cultural monuments in Kelmend, it is recommended to hike along the signed and GPS mapped trails, and accompanied by local guides. They know the area very well, can point out different highlights or tell stories about the area and its past. – Kelmend can easily be reached by car, however a four-wheel-drive is recommended as part of the road has not been paved yet to reach remoter areas. From Tirana, take the highway SH1/ E762 to Shkodra. From Shkodra continue on the road which directs you to Montenegro, passing Koplik and Bajza. Instead of turning left to cross the border, follow the SH20 towards Lepushë and Vermosh. The Tourism Information Office in Tamarë, guesthouses or local guides can pick up tourists during the day with four-wheel-drives or minibuses from Shkodra. – From Tirana, buses and minibuses to Shkoder leave frequently (every hour; during summer even every 45 min.) from Karl Topia Square, which is also known as “Zog i Zi”. From Shkodra minibuses leave for different villages of Kelmend.